The staff and members of the NGO AWHHE participated in many national and international events, seminars, workshops, trainings, conferences and forums: CSD-15 preparatory meeting in USA; IPEN meeting in Senegal; meetings: “Millennium Development Goals by Ministry of Finance; “European ECO Forum Strategy meeting” and “Increasing NGO participation in the Pan European Environment and Health Process” in Belgium; Ecosan in Bulgaria; Stockholm Water Week, Working Conference in Kiev and Eco-sanitation in China. AWHHE collaborates with the Ministry of Nature Protection, Ministry of Agriculture, Ministry of Health, Armenian Parliament and Armenian Water and Sewerage CJSC ”Hayjrmugh”. 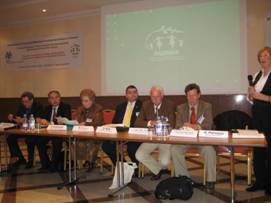 The regional conference “Partnership for Achieving the Millennium Development Goals (MDGs) in Armenia” was organized on October 27, 2007 in Yerevan. About 70 representatives participated in the conference. Among participants were officials from Ministry of Health, Ministry of Agriculture, Ministry of Nature Protection, Ministry of Urban Development, representatives from WHO, UNDP and UNIDO, WWF Armenian offices, as well as experts from Aqua for All, Swedish Institute for Infectious Disease Control, WECF, Water and Sewerage CJSC, Committee of Water Resources, also Georgian NGOs, Armenian NGOs, leaders from targeted villages and marz authorities. The conference aimed at drawing the public attention to the sustainable rural development, in particular to the provision of the rural population with clean, safe drinking water, safe sanitation, and also to the development of alternative farming. The representatives of “Amur koriz” were invited to bring organic products from their markets and sell them during the “Regional Conference on Water and Sanitation”. Thus, the conference participants got an opportunity to buy organic or non pesticide products and the idea was very good for the promotion of organic market and products. 5 new leaflets on water, agriculture and hygiene (“Don’t Pollute Our Water”, “Let’s Save Water”, “The Role and Importance of Green Fertilizers”, “The Clean Teeth are the Pledge of Health” and “Hand Care”) and 1 Brochure “Alternatives to Pesticides” were created. AWHHE’s community mobilization unit worked intensely in the schools of the three project villages. Lectures on health, sanitation, waste management and organic farming and 3 eco-games on biodiversity and water were conducted for 607 schoolchildren. Eco-competitions on composting were organized in the targeted schools. The main purpose of these activities at this step was to introduce to schoolchildren the general idea of waste management and recycling, composting and sanitation and to get them interested in current ecological situation. The schoolchildren and teachers were very enthusiastic. Composting activities with school children in school gardens of Hayanist, Dzoraghbyur and Fantan and in orchard of Saghmosavan were conducted. During this activities children gained practical skills and knowledge about composting and its future use. The school principles were very grateful to the donors and manager of the project. The ecological study room was established in Fantan school. AWHHE provided information materials created by AWHHE and other organizations. AWHHE created a 17 – minute movie “The cost of Poverty” on air pollution in Armenia. Movie was presented at CSD-15 meeting in New-York and at the Ministerial conference in Vienna. The radio and TV programs were presented on air pollution, pesticides usage, obsolete pesticides burial, water and waste. All programs highlighted ecological issues in Armenia. The articles were published in the national and local newspapers and magazines. In frame of information campaign AWHHE created a cartoon on waste. The cartoon was shown by HAY TV, Erevan TV, Armen Akop TV and Shoghakat. Website: The updated website is more functional, clear and complete in terms of structure, it looks pleasing to the eye as well. English and Armenian versions are available and can be easily accessed from either version. The number of people that visit the website can be monitored based on the online data counter which is located in the bottom right part of every page. We have no any doubt that these activities aimed to raise awareness on environmental issues will be imprinted on mind for a long period of time. Fantan: AWHHE finished designing dry urine diverting toilet in Fantan with participation of architect office QUELQUE CHOSE and technical specialists. To improve the quality of sanitation in the school of Fantan, hand-wash facilities and dry urine diverting toilets were constructed in conjunction with the school. The dry urine diverting toilets serve as examples how to improve the sanitary and hygienic conditions in particular for the children on a sustainable manner; how to protect soil and groundwater against infiltration of human excreta. 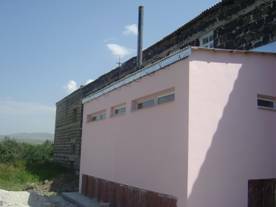 Now the pupils and school staff use comfortable, warm, clean and odour-free toilets. The ecotoilet has been operated since September, 2007. The dry urine diverting toilet is equipped with special squatting slabs that divert the urine from the faeces, which are then collected separately. Instead of flushing, the faeces are covered with sawdust that absorbs the moisture and prevents smell as does the removal of the urine. It was possible to construct the toilet directly adjacent to the school building, which would make the use of it easy for the school children. Training on maintenance of ecotoilet for personnel in Fantan was organized. The caretaker looks after the toilet, cleans and maintains it every day. 175 schoolchildren were trained on using the ecosan toilet. The sand filter was constructed for the grey water of the school toilet. The facilities were opened festively; participants from the regional conference and village authorities were present. Among participants were international experts on water and sanitation. They inspected the toilet building with great interest giving some interesting advice. In Fantan school in 2006 AWHHE carried out an investigation of 59 schoolchildren’s stool for the presence of helminthes Eight children had threadworm and 2 had ascariasis. 10 infected children and 10 contact children were treated. The repeated investigation of 10 schoolchildren’s stool test on the presence of helminthes conducted in January 2007. Investigation was done by the main specialist of the Republican Center of the Disease Control (RCDC). There were no helminthes found. 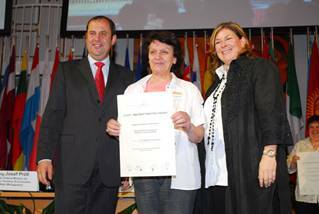 AWHHE participated and presented the project “Ecological Sanitation in Rural Armenia” in the “NGO Best Practice Award” competition organized by WHO and the Austrian government in frame of the Vienna Intergovernmental Mid Term Review Conference, 11-15 June 2007. AWHHE was awarded as a winner at this conference. Hayanits orchard: An organic peach and apricot orchard on 3300 m2 was founded in Hayanist. 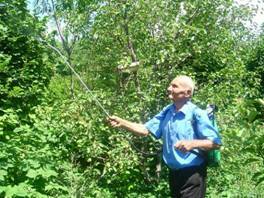 Treatment of fruit orchards using the vegetative preparations in Fantan, Saghmosavan and Dzoraghbyur were organized. Treatment of trees was done by plant liquids from wormwoods (Artemisia absinthium) and milfoil (Achillea millefolium). During each treatment of fruit orchard we also organized field days for neighbor farmers. The hunting belts were put against insects 2 biological (pheromone) traps were hanged in each orchard against (Laspeyresia) seedworms. 4 trainings for farmers and other interested people were organized on sustainable agriculture and IPM promotion. Total number of participants in trainings was 63. During the trainings we presented our experience in replacing pesticides by herbal pesticides as a part of IPM implementation and also all other necessary points of sustainable agriculture as crop rotation, composting, bio humus production and use. 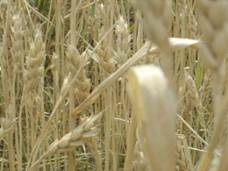 Fantan demonstration field: The harvest of onobrychis and winter wheat was a good harvest for Fantan conditions. It is more than middle harvest for Fantan for winter wheat and good harvest as organic one without niter. The NGO “Shen” invited AWHHE to participate in Organic products autumn fair. On the opening day organic products of all producers were presented. 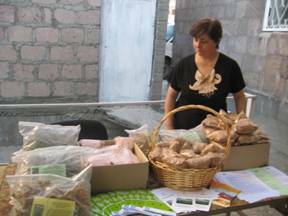 AWHHE also had its one table where all AWHHE information materials, winter wheat and spelt, amaranth and dried plants wormwood and milfoil were presented. The autumn fair was a very nice event and gave opportunities to organic producers to sell their products. AWHHE was the only presenter of cereal crops. Amaranth pilot – In November, 2006 began the work on the use of Amaranth as a protein additive to the fodder of the domestic cattle started. The experiment aimed at confirming the data about the effectiveness of feeding with Amaranth. As a result of the experiment a farmer from Hayanist expressed a desire to grow amaranth on his own and he applied to us for help in regard to seeds. The relatively high cost price of amaranth hay made the introduction of the amaranth as a valuable substitute in the ration of agricultural animals impossible. In Dzoraghbyur it was planned to feed suckling pigs with seeds that were kept in a store. The animals were fed with amaranth powder as 30% substitute of the main fodder, and the other suckling pigs were fed as usual. Stevia – In 2005 the NGO AWHHE developed a project aimed at contributing to the rural sustainable development through promotion of separate farms for growing stevia that has a distinct pharmacological effect, particularly for diabetics. It is an excellent substitute of sugar. The seeds were transplanted in pots. During the three years of its activities in growing stevia the NGO AWHHE succeeded in obtaining plants of stevia acclimatized to local conditions and also in getting seeds with low cost price. We came to the conclusion that stevia may become popular in Armenia if modern technologies of the processing of the dry leaves are used and if this produce is widely propagandized. Moreover, it is necessary to work out normative documentation, to conduct clinic trials and a broad publicity campaign. Fantan: The project had acquired water meters for Fantan in cooperation with the drinking water supply company, so that the village could have received household connections via an already existing central water supply system. Ambiguous regulations, unresolved questions of ownership and unclear assignations of responsibilities prevented the actual supply of water, even when all pipes were connected and meters were installed. This issue revealed that many realities of the rural life in the countries of the former Soviet Union had not been elucidated in the official reports, and many problems had resolved very slowly. Micro-biological analyses of water were done twice in three villages: Hayanist (34 samples), Dzoraghbyur (6 samples) and Fantan (4 samples). Republican Center of Disease Control analyzed the samples and the expert’s conclusion was provided. From the analyzed 44 water samples 6 were contaminated. 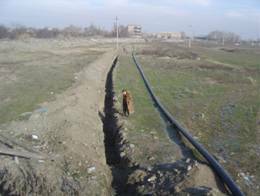 Drinking water in Hayanist: The water supply of Hayanist is performed from the pump stations “Araratyan 1, 2”. “Armenian Water & Seweage” CJSC has undertaken certain steps to optimize work of the pump stations ”Araratyan 1,2”, in the result of which in the junction with Hayanist, according to the initial estimation, the pressure will be 7 atmospheric pressure. It is foreseen that, after the completion of the construction of the pump station in Massis, Hayanist will have 10-12-hour water supply. In parallel with the increase of the water pressure in the junction, thanks to a bigger diameter of the water pipe the water quantity will also increase, that is necessary for the further development of the village, and what is very important, the pressure will be improved in the distributing network of the village, and in all those parts of the village where the water pipe lines are laid on, the villagers will be provided with 8-hour water supply. The water sector of Hayanist that passes through the village, is designed to leave in the water supply system of Darbnik as a distributing network. This sector will be connected to the operating distributing network of Darbnik. In this way those subscribers that have illegal connections to the low pressure water pipe of Hayanist, will be provided with better conditions of Darbnik’s network. At present the water pipe of Hayanist is completely being replaced with new, polyethylene pipes of diameter DN 200 mm. The earth work is already finished, the installation and connection of pipes is in the process. Citizens organized their support for the project activities, on the initiative of AWHHE staff, via village- and women’s committees, who took an active part in the awareness raising activities, as well as in implementing, and sustaining the demonstration projects. The projects focused on involving women in project implementation and local-decision making process. The topics of the organized meetings were ecosanitation, drinking water issues in Hayanist (construction of the pipeline), organic farming and water meter installation difficulties in Fantan. 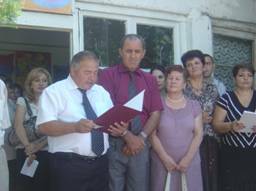 The Council of Hayanist granted diploma of Honored Citizen to Lilik Simoyan: „Appreciating Lilik Simonyan’s role and efforts in the further socio-economic development of the Hayanist Community and expressing the gratitude of the Community, according to the Article 16, point 24 of Law on “Local Self-Government”. Strong commitment of the local authorities is required. Good cooperation between the school staff, local authorities and AWHHE staff makes easy to implement the project. The trust between the villagers and authorities for successful implementation of the project is of a big importance. Better involvement of schoolchildren in ecological education is the pledge of success..
Ecological sanitation approach is reasonable in regions that lack central water supply, adequate sewage systems. Construction materials are extremely expensive in comparison with the local salaries. The lack of financial support from the government to those farmers who are engaged in organic farming is an obstacle to develop alternative agriculture.